Revenue missed our expectations due to a substantial drop in gold sales volume but net profit exceeded our expectations due to the FX gain and tax credit. Carbon-in-leach plant began trial production in the early Nov-17. Exploration work in Sokor, Pulai, and Kelgold in on track. We revise up earnings forecast by US$603k for FY17e due to the FX gain and tax credit, and meanwhile, we revise it down by US$411k for FY18e. Accordingly, we raise our TP to S$0.3 (previous: S$0.29), and we maintain our recommendation NEUTRAL. + Carbon-in-leach (CIL) plant has been completed. It was expected to complete the construction in mid Nov-17, but the group managed to accomplish it two weeks in advance. 6th Nov marked the kick-off of trial production of the plant. Meanwhile, there were 18,000 tonnes of higher grade ore explicitly stockpiled for the ramp-up in operation, following the completion of a trial run. The total capex for the plant was less than RM25mn (c.US$6mn) which is substantially below the market expenditure of a similar capacity plant. CNMC recycled some used materials without compromising the quality. 70% of the total costs had been capitalised in the last two quarters and the rest will be forked out in 4Q17. Moving forward, CNMC will explore the Ketubong area which has never been mined previously. Any extracted ore will be processed by CIL. The operational costs of CIL plant are estimated to be comparable to those of heap leach plants. + Sokor, Pulai and KelGold project are progressing. The group plans to expand the exploration of the orebody towards the east in Sokor field where 10 drill holes were completed in 3Q17. Moreover, it will kick-start the study on the lead-zinc orebody at Sg. Amang in 4Q17. For the Pulai project, the group completed 9 drill holes at the northern anomaly of iron ore prospect in 3Q17. It will conduct more geological works at Peninsula area where gold mineralised segments were observed. For the KelGold project, soil sampling was completed in 3Q17 with gold anomaly zone identified in Jeli area where trenching activities had been carrying out. – Low ore grade issue protracted while the gold price was flattish. Total sales volume of gold collapsed by 41.3% YoY to 3,691 oz in 3Q17. Accordingly, the YTD sales volume of gold arrived at 11,197oz, only 48% of the total volume in 9M16. The average realised selling price (ASP) slid to US$1,275/oz in 3Q17 (3Q16: US$1,345/oz). However, the 9M17 ASP grew mildly by 1.1% YoY to US$1276/oz. The low-grade issue is expected to remain status quo in 4Q17 though CIL plant is under trial operation. For the outlook in FY18, we believe the 18,000 tonnes of high-grade stock awaiting for CIL could boost the performance temporarily. However, solutions to improve the production volumes rely on either the ability to find high-grade ore beyond the existing fields that are being mined or monetisation of other minerals such as silver, zinc, lead, and iron ore. Last but not least, acquiring other gold mines that are generating relatively stable income flows is another alternative. CNMC has been proceeding various strategies so far, and we expect some of which will pay off in FY18. We lower the forecast of implied gold grade to 0.18 g/tonne (previous 0.2 g/tonne). Due to higher estimated production, the all-in cost estimation is changed from previous US$843/oz to US$810/oz in FY18. We revise up earnings forecast by US$603k for FY17e due to the FX gain and tax credit, and meanwhile, we revise it down by US$411k for FY18e. Accordingly, we raise our TP to S$0.3 (previous: S$0.29), and we maintain our recommendation NEUTRAL. 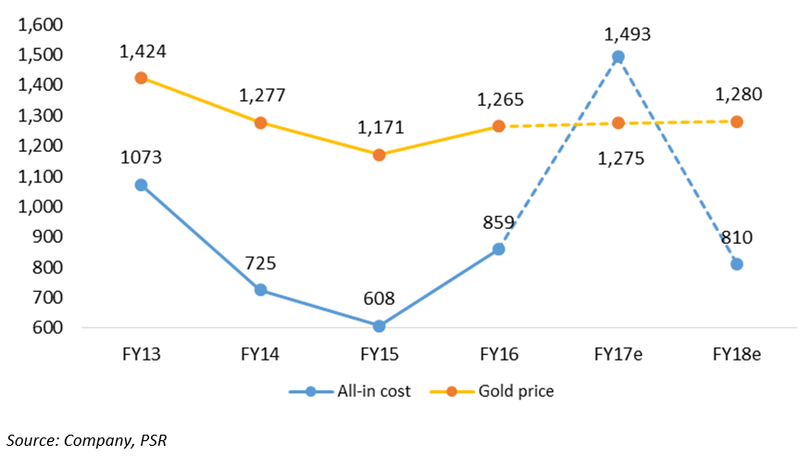 We are upbeat on gold prices and expect the production will bottom out in FY18.